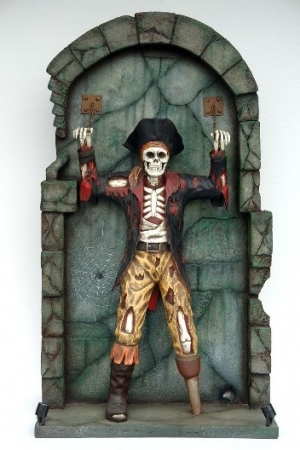 This amazing model of Pirate Skeleton chained to a dungeon wall is made from poly-resin and fibreglass and looks fantastic. Imagine this stunning figure in your pirate or horror themed area. This Pirate Skeleton model comes complete with the dungeon wall he is chained to and it has 2 halogen lights attached with electrical leads. Just put the model in place, plug in and watch people jump! 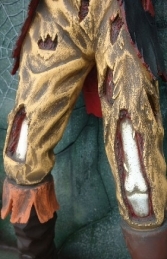 The replica wall is over 7ft tall and is sure to amaze (or scare) all your visitors, the detail is great, there are even maggots and a rat included in the modelling. This fantastic life-size skeleton figure is ideal for themed areas, advertising or drawing attention to your business. 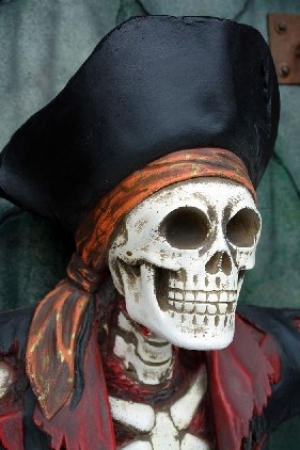 It can be used in any pirate or horror themed area or in shops, businesses, pubs, restaurants, coffee shops, adventure golf courses, zoos, theme parks.